Showing 58 articles from November 2, 2016. LOUISBURG -- By the time early voting ends on Saturday, election officials figure more people will have cast a ballot than during the same time four years ago. "Turnout has been very good," said Elections Director Lisa Goswick. By Tuesday afternoon, 11,741 people had cast an early ballot and 492 people had returned their absentee ballot. LOUISBURG -- The State Department of Health and Human Services shut down an assisted living facility that had a history of conditions that placed residents' welfare in question, local social services staff said. Autumn Wind Assisted Living facility was also the subject of a criminal investigation and a civil lawsuit regarding residents' complaints of financial mismanagement, but the state's revocation of the license last week is not related to that matter, local social services staff said. BUNN -- Greg Fishel served as the guest speaker for the Farm City Luncheon last week, and while pleasant weather provided great small talk, the long-time meteorologist had more controversial matters on his agenda that usually don't get discussed around most dinner tables -- climate change, politics and religion. "... It is polarizing, seemingly as every issue in the world is now," Fishel said after opening with a few jokes that then gave way to the heavy topic. 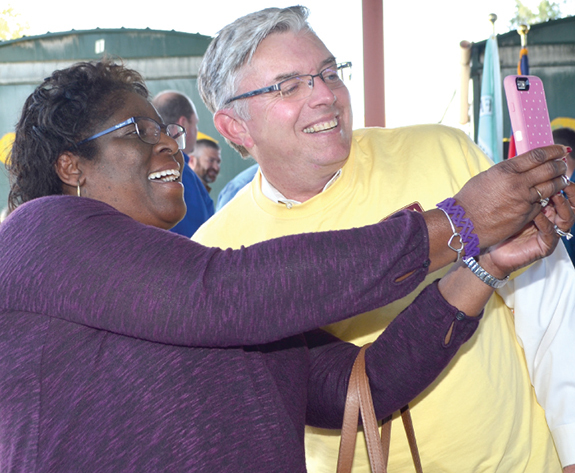 "I'm not here to change your mind," the long-time WRAL meteorologist told those gathered at Mitchell Farms in Bunn for the annual event designed to foster the relationship between farmers and the urban centers that rely so heavily on agriculture. Youngsville Assistant Fire Chief Brandon McGhee (left) and Jim Pearce, president of the Franklin County Firefighters Association (second from left), presented co-Firefighters of the Year awards to Tommy Lloyd, center, and his son, Justin Lloyd, who died over the summer as a result of Cystic Fibrosis. Tommy Lloyd and his wife, Jenny, right, raised Justin as their son. 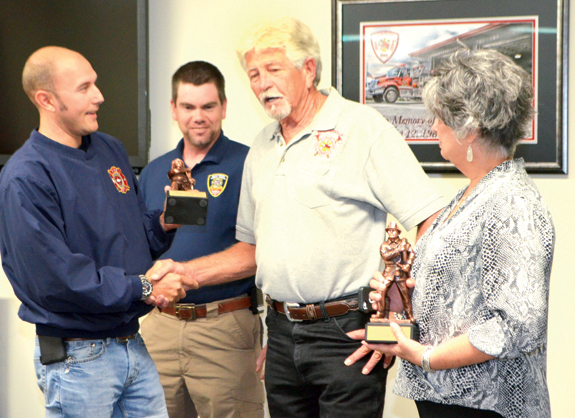 Justin Lloyd was a volunteer firefighter and, in April, was presented with the Lifetime Membership Award for his continued love of the Youngsville Fire Department and community during the department's first installation ceremony. BUNN -- Soil and Water Conservation District board member Carvel Cheves noted that it has been said: if it were not for six inches of topsoil and the fact that it rains, people would not exist on this planet. Last week, T.S. 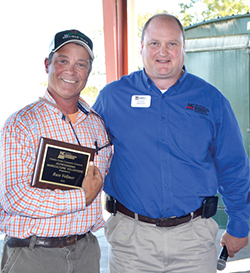 Dean Farms operator Spencer Dean was highlighted as taking extra special care of that precious commodity as he was recognized as the Conservation Farmer of the Year at the annual Farm-City Week Luncheon organized by the county's cooperative extension office. Whoa! Most of us didn't see that coming! When television personality and meteorologist Greg Fishel was announced as the featured speaker for this year's Farm City event luncheon, most of us around here groaned a little. Even my 12-year-old son uttered an "ugh" when told who the speaker was going to be -- and he couldn't even attend since it was a school day. Okay, you've put it off just about as long as you can. However, if you've already voted, you don't need to read any further. If you've voted, accept a pat on the back for doing your civic duty as an American citizen then sit back and watch the election returns and analysis over the next several days. At the risk of piggybacking on the column above, I want to talk about social media. But first, I want to talk about the world we inhabit. It's weird. It's fast moving. And, it can be dangerous. All three of those things were on display on Monday in the kind of plot that would make a "Seinfeld" writer jealous ... if that show ever delved into the truly disturbing. A few minutes save lives! The seemingly sudden, although not unexpected, arrival of fall-like temperatures should serve as a vital reminder to all of us -- a possibly life-saving reminder. When the nights turn chilly, folks begin to fire up heating systems, space heaters, fireplaces, wood stoves and the like. And that sometimes means serious trouble. Before truly cold weather arrives -- when heating options become necessities -- make sure that whatever device you're using is in a good state of repair, tuned up for the hard uses of winter and properly vented. 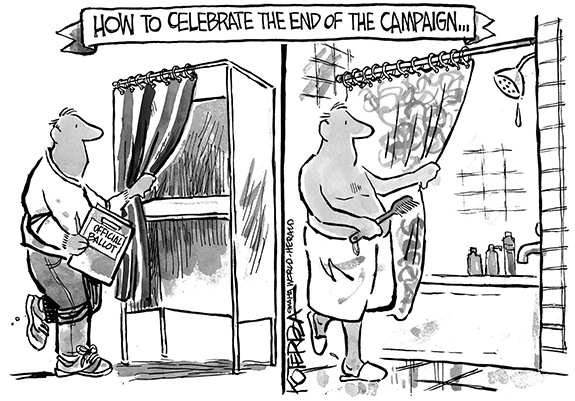 For many years I have volunteered at the polls advocating for candidates. Often, I stand next to others being paid for what I willingly do without pay. I once took exception to people running for office paying poll workers. Somehow, to me, it just did not seem right for someone to seek pay for doing something by conviction they believed in. My thinking has evolved. If it is simply a job to them, then they should be paid. Fair, yes I think so, all candidates can do this. This said, it is one thing advocating for someone, asking for your vote, and another to give voters a pre-filled out sample ballot, and tell or try to intimidate them to vote for someone. The arrogance of it, I feel has risen to a level of voter disenfranchisement. Not voting? Look in mirror when you want to complain! If you are pressed for time today I will sum up my message in one succinct phrase: If you haven't already voted, please do! That is my simple message today. I would like everyone who is legally eligible to vote to exercise their franchise. Ballots will vary a bit around the county due to districts, but in most cases the choices seem pretty clear cut to me. 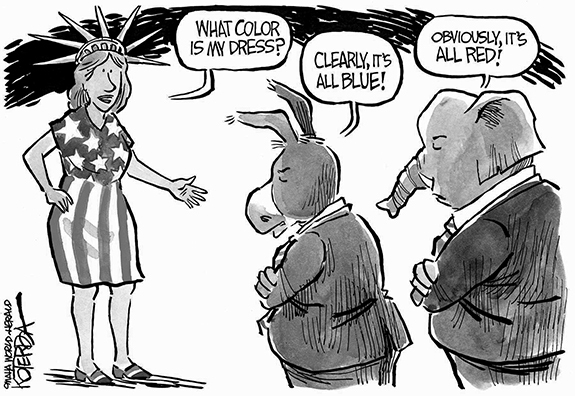 Of course someone from the opposite political philosophy may feel the same while favoring another option. How fortunate we are to have the availability of "early voting." If we did not, many of our citizens would not be able to exercise their right to vote, and our participatory democracy would be endangered. A large country such as ours should provide access to nearby polling places over a generous period of time. I have become well acquainted with the Franklin County Community Foundation. Over the past 10 years, I've witnessed it change lives and improve the quality of life in our county. Local awards and education mini-grants made since its inception total more than $48,000! ACA: Which plan is best? From now to Election Day, Nov. 8, the Affordable Care Act (ACA), commonly referred to as Obamacare, will be hotly debated by the Democrat and Republican candidates for president. Republican Donald Trump has said it is a terrible law and he has vowed to repeal it. WAKE FOREST - Carson Roger Lindsey, 18, died Monday, Oct. 31, 2016 from injuries sustained in a head-on collision in Louisburg. 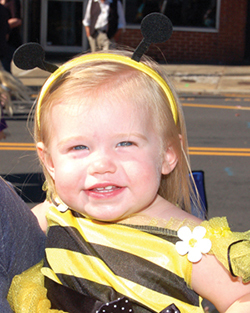 A celebration of Carson's life will be held at 1 p.m. Saturday, Nov. 5, in the Gymnasium of Wake Forest High School. DONALD "DONNIE" T. EDWARDS, JR.
LOUISBURG - Donald "Donnie" Tharrington Edwards, Jr., 47, of Louisburg passed away on November 1, 2016 at his home. Born in Vance County on February 28, 1969 to Donald and Diane Etheridge Edwards. A 1988 graduate of Louisburg High School, Donnie worked at Edwards Grocery prior to retirement. He also loved woodworking as a hobby. WARRENTON - Jennie Virginia Brown Baskett, 94, died Monday, Oct. 31, 2016 at Maria Parham Medical Center. 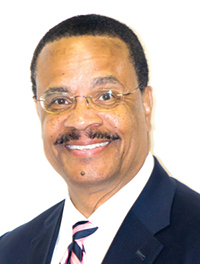 A funeral service will be held at 1 p.m. Friday, Nov. 4, at Jones Chapel Missionary Baptist Church in Louisburg. Interment will follow in the church cemetery. LOUISBURG -- Louisburg High School has swept through the Class 1-A State Volleyball Playoffs to date, winning four matches in the minimum number of 12 sets. But while the Lady Warriors have been rolling on the court, Louisburg did experience a setback Tuesday when Coach Erica Wammock found out that Thursday's state semifinal showdown against Williamston Riverside would be on the road. 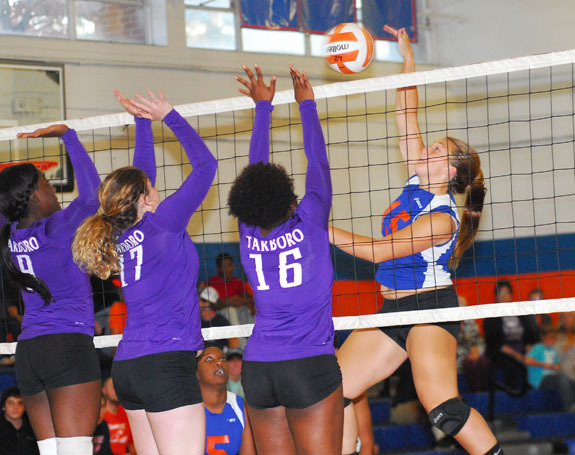 Pictured (Above): Louisburg High School's Summer Phillps (right) elevates for a kill over a trio of Tarboro defenders during last Wednesday evening's first-round action of the Class 1-A State Volleyball Playoffs. BRING IT IN. 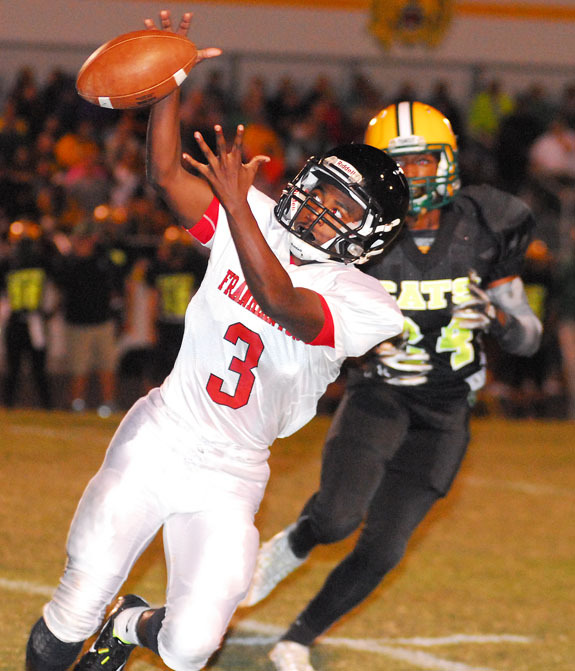 Franklinton High School's Tavion Jefferies attempts to secure a pass reception during his club's road game last Friday night against backyard rival Bunn in Northern Carolina Conference prep football action. 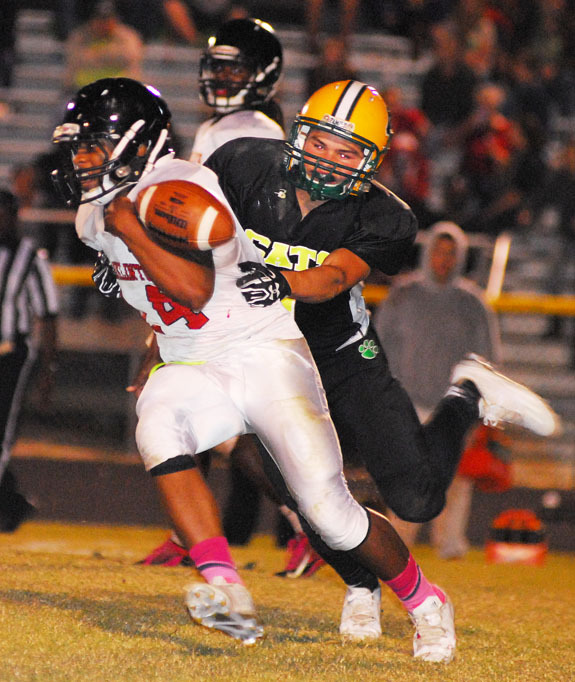 BUNN -- One play was all it took for Bunn to establish control of its Northern Carolina Conference home football showdown last Friday against backyard rival Franklinton. BHS' D.J. Jones, who enjoyed another big night in the backfield, returned the opening kickoff 93 yards for a touchdown, and the Wildcats would go on to defeat the Red Rams by a 42-14 margin -- and wrap up no worse than a share of the NCC crown. 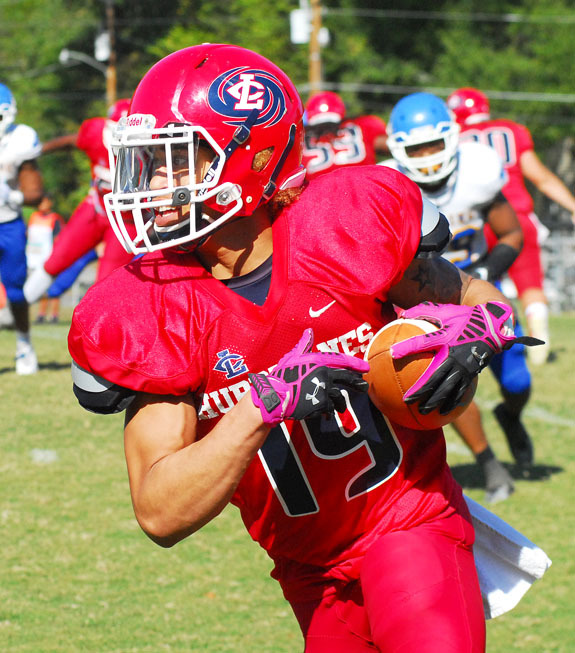 LOUISBURG -- Louisburg College faced a tough opponent, and an ever-decreasing time clock, in its effort to remain unblemished for the 2016 football campaign. Taking on Hocking College from Ohio as part of homecoming festivities, the Hurricanes found themselves trailing by nine points midway through the third period of action. 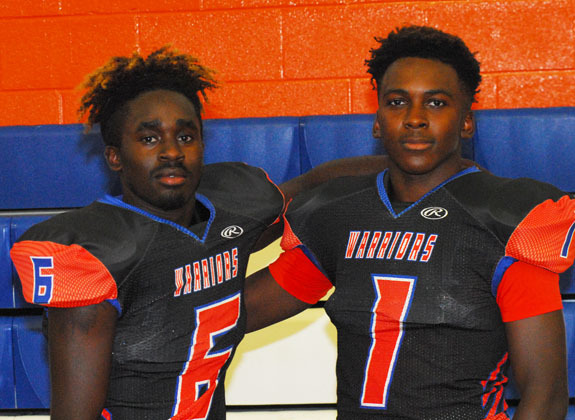 AURELIAN SPRINGS -- Things were close for one half, but Louisburg took charge and went on to secure a key Tar-Roanoke Athletic Conference football victory last Friday at Northwest Halifax. The Warriors led by just eight points at the break but were dominant the rest of the way en route to delivering a 49-12 road triumph over Northwest. Louisburg is now 5-4 overall and 3-1 in the TRAC. FRANKLINTON -- Franklinton put together the most historic postseason run in school volleyball history -- and gained plenty of frequent traveler miles along the way. After opening the Class 2-A State Playoffs with a home victory over East Duplin, the Lady Rams hit the road for contests at faraway locales Dixon, South Columbus and Currituck. LOUISBURG -- Louisburg College achieved perfection in the men's portion of the Region X Cross Country Championships. Louisburg, which hosted the meet two weeks ago at Owens Park in Franklin County, picked up the almost-unheard of feat by finishing in the Top Five of the men's individual race in the annual event. Louisburg even went two steps beyond that by boasting the seven highest finishers. HELPING HAND. Louisburg College baseball player Luke Haines helps a youngster during an at-bat as part of the Hurricanes' recent visit to the Miracle League of the Triangle in Cary. CARY -- Louisburg College's baseball players came to the diamond recently not to throw knuckleballs and slam homersm but to support their buddies playing America's favorite pastime. At the plate and in the field were men and women who struggled to run, to swing a bat, to make sense of game statistics -- people with special needs who nevertheless enjoy baseball as much as any pro. GREENVILLE, S.C. -- Furman University women's basketball team is a consensus fifth-place pick in a pair of Southern Conference preseason polls by coaches and media, and Paladin senior guard Whitney Bunn was among 10 players named to the 2016-17 Preseason All-SoCon Team. Led by defending SoCon Tournament champion Chattanooga, the consensus No. 1 choice, the top six teams were identical in both polls, with Mercer placing second, followed by Samford third, East Tennessee State fourth, Furman fifth, and Western Carolina sixth. HENDERSON -- The Vance-Granville Community College Vanguards men's basketball team is scheduled to play at least 28 games during the 2016-2017 season, including 11 home games. This is the program's first season under the leadership of head coach DeMarcus Oliver. The Vanguards compete in Region X of the National Junior College Athletic Association (NJCAA) Division II, which includes 11 two-year colleges in North Carolina and Virginia. HENDERSON -- For the Vance-Granville Community College Vanguards, the 2016 women's volleyball season will long be remembered as historic. VGCC compiled a winning record (14-8) in the regular season, reached .500 in conference play (6-6), and won a match in the postseason -- all for the first time in the history of the program. In fact, those were all goals that Coach Christopher Young, a Youngsville resident, had set for the Vanguards at the beginning of the year. GREAT SEASON. 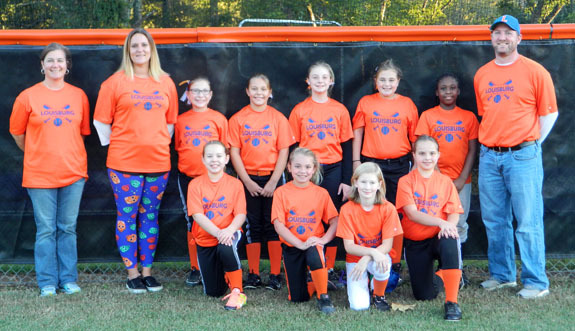 The Louisburg Parks and Recreation 10-Under Softball Team recently wrapped up a successful Fall Ball campaign. Pictured are (back, l to r) Coach Kelly Nelms, Coach Brittany Pillar, Lindsey Lundy, Camryn Pillar, Lilly Alford, Bailey Nelms, Sommer Cooper and Coach Casey Lundy; (front, l to r) Lacey Medlin, Savannah Norris, Kendall Fosness and Haylijane Highfield. Not pictured are Shanyah Wheeless and Layla Perry. 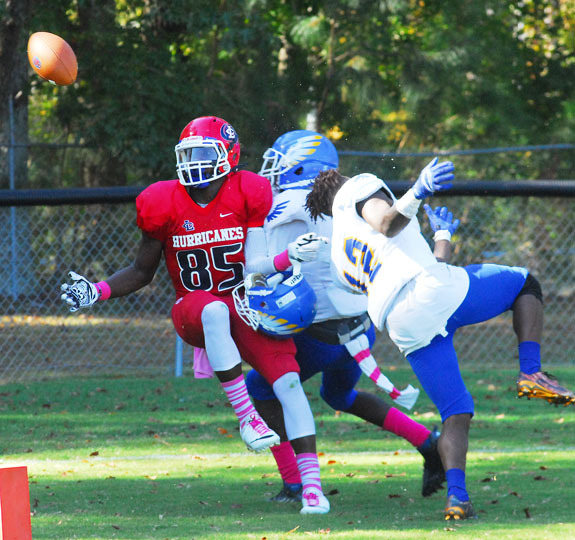 Louisburg College's John Brooks (85) tries to come up with a reception for the Hurricanes during last Saturday afternoon's home football victory against Hocking College. Bunn's Dylan Timberlake (right) causes a key fumble that was recovered by teammate Celik Curtis during last Friday night's home football victory versus Franklinton. 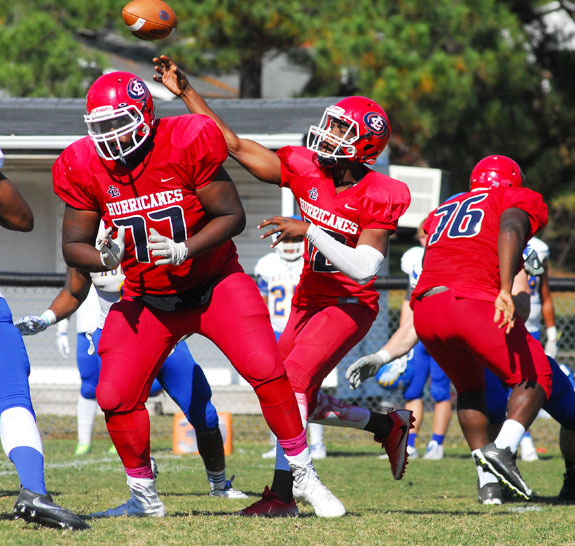 Louisburg College quarterback Terrance Ervin attempts a pass for the Hurricanes during last Saturday afternoon's home football decision against Hocking College. 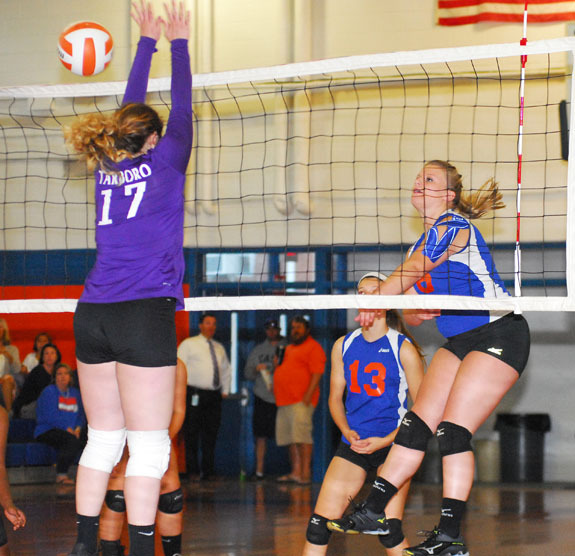 Louisburg's Sarah Foster (right) elevates for a kill last Wednesday against Tarboro in the opening round of the Class 1-A State Volleyball Playoffs at the LHS Gymnasium. The first Farm City Week was born in 1955 when Charles Dana Bennett, businessman from Vermont and Merle H. Tucker, chairman of Kiwanis International Agriculture and Conservation Committee, were seated together on a train headed from Chicago to Washington, D.C. In 1955 the net farm income was declining. Farm cost, debts and property taxes were on the rise. Charles and Merle were having discussions about the poor public image of agriculture, the strong urban influence on ag policies and a growing population with no direct ties to agriculture. 4-H VOLUNTEER OF THE YEAR. The award for "Volunteer of the Year for 4-H" was given to Jan Marie Potter (at right). She is a dedicated 4-H volunteer and mother. She volunteers her time and sewing skills during summer fun programs and other events throughout the year. Meg Wyatt Extension Agent, 4-H Youth Development, presents the award. Agriculture Volunteer of the Year. Russ Vollmer (left) was recognized as the 2016 Cooperative Extension "Agriculture Volunteer of the Year." 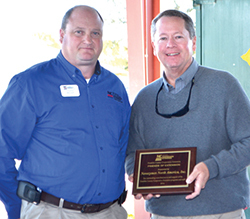 Presenting the award was Charles Mitchell, county Extension director. Vollmer currently serves as the Advisory Leadership Chair for CES. He has given back to agriculture through helping educate new and beginning farmers by opening his farm for tours, speaking at Extension programs and special events. 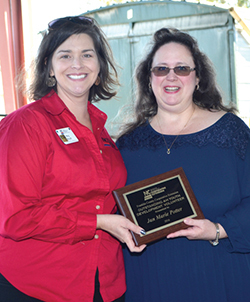 Novozymes North America Inc. was recognized with a "Friends of Extension" award for their continued support of Cooperative Extension programs at the local and state level. Novozymes staff serve on many boards and work closely with Extension staff on many projects. 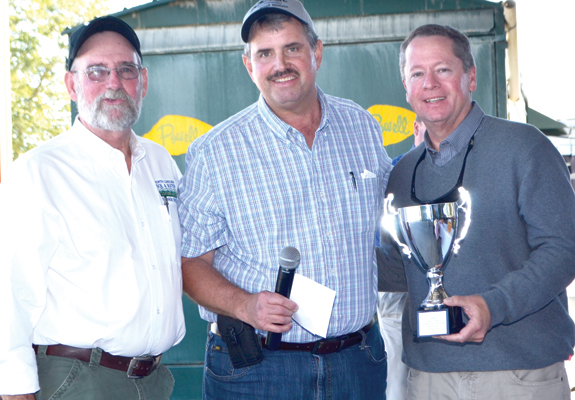 Charles Mitchell, County Extension director (left) presented the award to Novozymes employee Randy Green, who accepted the award for the company. The holidays are near. Time to be thankful, enjoy family, friends and food. While it's great to enjoy all of the greatness that the holidays bring, it's also important to keep yourself and your loved ones safe by practicing food safety. I would like to remind you of a few tips that will help keep everyone safe during this holiday season. Tip #1- Clean-Wash hands and surfaces often. North Carolina markets are not what we traditionally see in the South. For the South pine prices for the major products tend to decrease in the third quarter, but in the third quarter of 2016 North Carolina landowners saw a significant increase in pine pulpwood prices, up over 15%, followed by chip-n-saw by 5%. Pine saw-timber was relatively unchanged from the previous quarter with a less then 1% decrease. If you want to join a dynamic, energetic group, then the Franklin County Beekeepers is the organization for you! During the last Wednesday of the month, the membership, which is constantly growing, convenes at the Franklin County Agricultural Building at 7:30 p.m. and learns the latest and best practices to successfully produce and market honey (bees) and honey products. 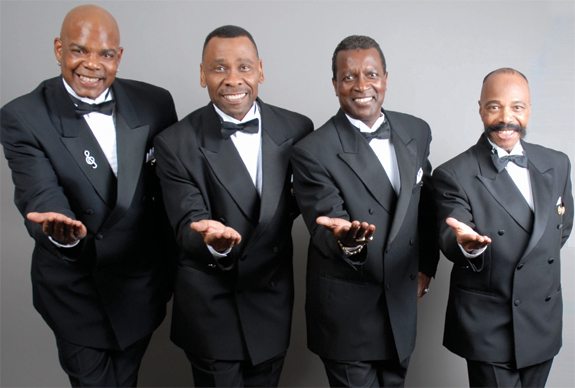 Rock and Roll Hall of Fame Inductees "The Drifters" will bring their soulful sounds to the Seby B. Jones Performing Arts Center at 7:30 p.m. Friday, Nov. 11. The Drifters, one of Rock & Roll's founding vocal groups, are again touring the U.S. After The Drifters began in the early 1950s, the singers had 20 years of uninterrupted hits, making them the second-most successful recording group of all time, according to Billboard Magazine. Through an historic journey involving five legendary lead singers, including Rock & Roll Hall of Famers Clyde McPhatter and Ben E. King, the group's ongoing story has covered the spectrum of Rock & Roll. A gardener's biggest challenge when planting trees and shrubs in this part of North Carolina is the soil. Most often plants suffer from improper soil preparation and planting techniques. A properly planted tree or shrub will be more tolerant of adverse conditions and require less management than one planted improperly. Very often I see trees and shrubs planted in compacted soil with a hole just big enough for the plant's root-ball to fit in. This sets the plant up for failure immediately. 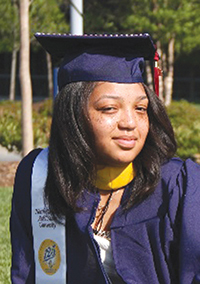 Brittney Williams of Louisburg graduated from North Carolina Agricultural and Technical State University (A&T) recently. She earned a degree in Child Development and Family Studies with a concentration in Family Relations: Cognate area of Early Education, also graduating with over a 3.0 GPA. While attending A&T, she was a part of professional educator organizations, a mentoring organization and she volunteered for three years within the Guilford County school system. She is the daughter of Carolyn Williams of Louisburg, and the granddaughter of Irene Williams and the late Eugene Williams Sr. of Louisburg. DUMPING DEBRIS. 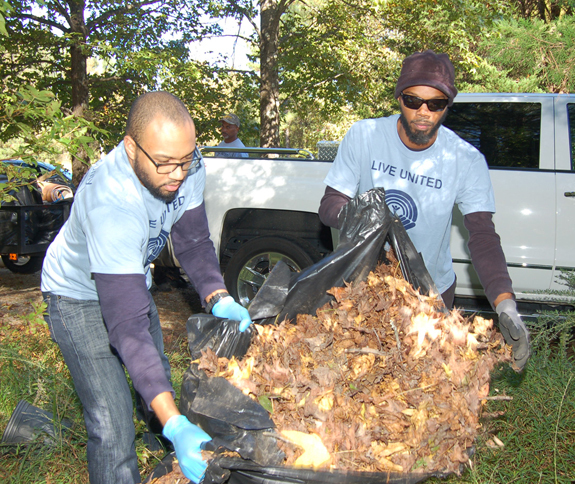 Kevin Jones, left, and Patrick Crudup clear debris from a yard during Day of Caring. Reaching out to help others! FRANKLINTON -- Victoria Greene-Epps opened her home recently to a crew of United Way church members who cleared her yard, straightened out a room and put down a new floor. Because of their hard work, the Franklinton resident expects that she'll be able to open her home to some kids who need one. "I'm considering some foster parenting," said Greene-Epps, noting that one of the projects included putting down vinyl flooring in one of the bedrooms so that kids wouldn't have any possible allergy issues. Louisburg College will celebrate the life of Allen de Hart, professor emeritus of history, on Nov. 12 in the De Hart Botanical Gardens on U.S. 401 south of Louisburg. De Hart, 90, who died Oct. 14, was one of the most influential people in the college's 229-year-old history and an active advocate for the arts in Franklin County. De Hart was buried in his native Virginia. FRANKLINTON -- Within three weeks, six people who either have Franklin County ties or have driven Franklin County roads have died in wrecks. The most recent accident was Oct. 28, when former Franklinton High student Christian Rogers died in a wreck in Halifax County. According to the State Highway Patrol, Rogers, 18, was approaching an intersection but ran the stop sign, T-boning a car that was heading west through the intersection. The Franklin County Farmers Market is located in Louisburg at the Shannon Village Shopping Center. 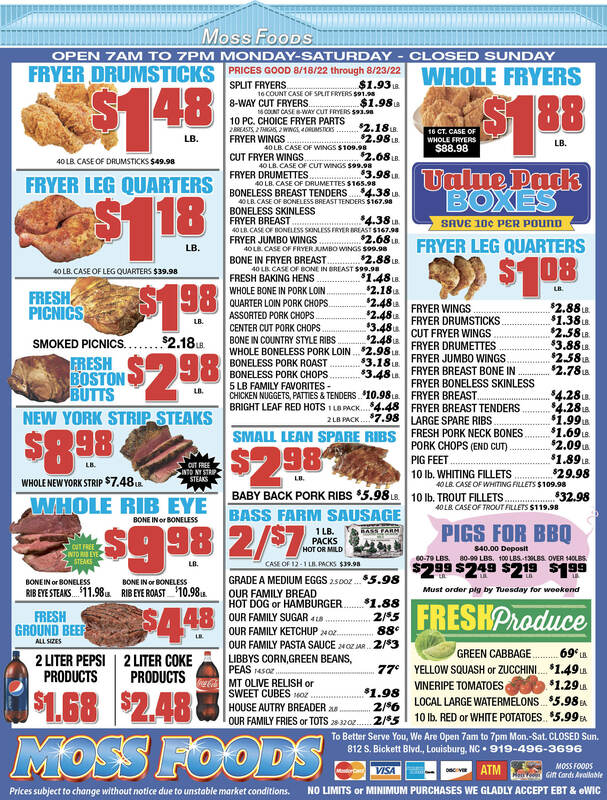 Market hours are Tuesday 9 a.m., Friday 8:30 a.m., Saturday 8 a.m. until sold out. The vendors all bring their best produce and products. With Thanksgiving just around the corner, our thoughts of what we are going to prepare for our home or what to carry to a gathering? The local farmers market offers a wide selection of fall seasonal produce. Pies, breads, jams, jellies are just right any time and even more so for the holiday table. Small farms continue growing in Franklin County and surrounding counties! In 2015, a Franklin County Small Farm Association was formed to meet the demand for educational information to help members be successful and to network with one another. The popular Annual Small Farms Opportunities Conference will be held at Vance-Granville Community College, Franklin Campus in Louisburg on Saturday, Feb. 25, from 8 a.m. - 3:30 p.m.
Actually getting farm families to discuss estate planning for future generations can sometimes be difficult. Laws affecting estates change just about every year. To get the latest information to farm families in the region, a regional conference has been scheduled for Wednesday, Jan. 25 in Louisburg at the Cooperative Extension Center from 9 a.m. until 3:30 p.m. There will be a minimum cost to participants. Occupation: Attorney for Vance County Department of Social Services and Warren County Department of Social Services (abuse, neglect and dependency cases, child support and adult protective services). Feeding Franklin Inc.'s Communitywide Fall Food Drive will run through Nov. 17. It's Feeding Franklin's first major food drive since becoming a full-standing non-profit earlier this year. Drop-off sites are at each town hall in the county and at each library branch. Other drop-off sites are at the county senior centers, Sunrise Biscuit in Louisburg, County Line Auto Service in Youngsville and CCB community bank in Louisburg. Brent Strickland, 54, is a lifelong resident of Franklin County. 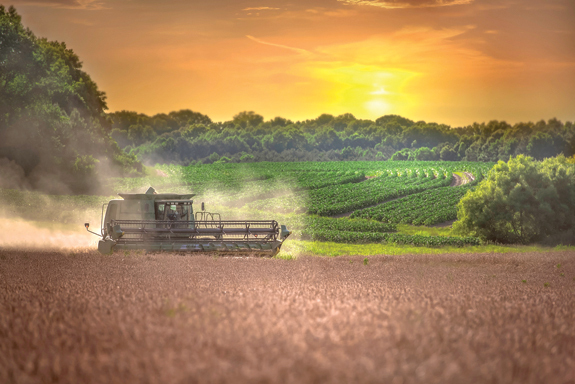 Jamie Thayer of Louisburg placed second in the annual North Carolina Ag Carolina/Farm Credit 2016 Photo Contest. A Franklin County golden hour sunset was the backdrop for a wheat harvest in the photo. "For the past couple of years, I have been fortunate enough to have had the wonderful opportunity to document and capture various agriculture and harvest seasons for Wester Farms," Thayer said. "It is such an honor to have had this image of Wester Farms selected." 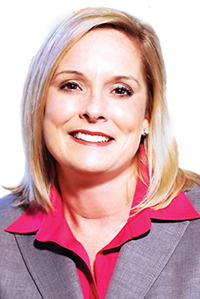 Dr. Adrienne C. Tounsel, recently opened her office at 3386 U.S. Hwy. 1 in Franklinton. Dr. Tounsel is a Board Certified Family Medicine Physician. She attended medical school at Wayne State University in Detroit. While in medical school, she was inducted into the Arnold P. Gold Honor Society,  a national honor society that honors senior medical students, residents, and physician teachers who have demonstrated excellence in clinical care, leadership, compassion and dedication to service. She then successfully completed her residency in Family Medicine and Urgent Care Track at the Toledo Hospital in Toledo, Ohio in 2011. The Greater Franklin County Chamber of Commerce will host a ribbon cutting for Monnie's Place in Downtown Louisburg 10 a.m., Wednesday, Nov. 9. Monnie's Place is a speciality shop and nutrition club, offering healthy food alternatives and community workouts. It is located at 203 Court Street, Louisburg. Owners are Donnie and Michelle Roberson.